Long-time Wakefield resident LCDR John “Jack” Greenwell, USN (Ret) (1922–2011) earned the Navy Cross, our nation’s second-highest military decoration, for dive-bombing and sinking a Japanese cruiser in April, 1945. Although he was born and raised in the Philadelphia area, Greenwell lived in Rhode Island for the better part of his life. He was a standout high school baseball player who spent a few months in the Philadelphia Phillies farm system before joining the Navy in 1941. As an aviation cadet, he played on the same baseball team as Ted Williams, Johnny Pesky and a number of other major leaguers who went into the service. He was commissioned as a Naval Aviator April 1, 1944, and served aboard the USS Yorktown, the USS Lexington, and the USS Leyte. 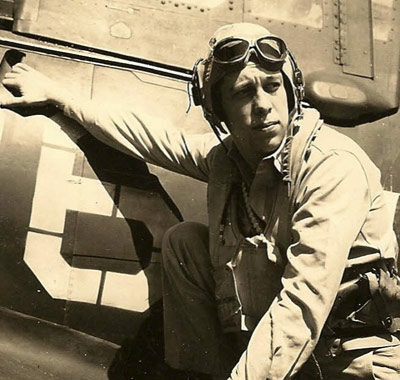 He was awarded numerous medals and citations in addition to the Navy Cross, to include the Distinguished Flying Cross, the Purple Heart, and five Air Medals. After the war, he was stationed at Charlestown, RI and then at NAS Quonset Point. While there he met Justine Shaw Paasche from Providence. They married in 1947, and Jack spent the rest of his life in Rhode Island. He worked as a sales representative for Red Devil Tools covering New England and New York, and rejoined the Naval Reserve in 1951. He continued flying as a reservist until 1965, rising to the rank of Lieutenant Commander.